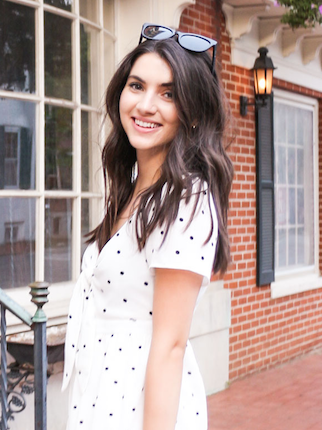 I want to start off by wishing everyone a happy Monday and also apologizing for the radio silence over here on the blog!! Sophomore year has been no joke between 5 classes, a new job, rush week for my business fraternity, and just settling into a new semester. Today's post is all about one of my new favorite brand, Barrington Gifts! I have been totally crushing on their products for a while now and after they kindly sent me one of their new fall St. Anne Tote I'm dying to order something else! Maybe this pouch to match?! This tote has become my go-to 'carry-all' bag that I use for going to class, running errands, heading to the gym, or even going out. For all you college gals out there, if you are looking to transition from a backpack to a tote, I would highly recommend this one! Inside the roomy tote there are three side pockets and one zippered pouch. And the best part? You can personalize the entire thing! 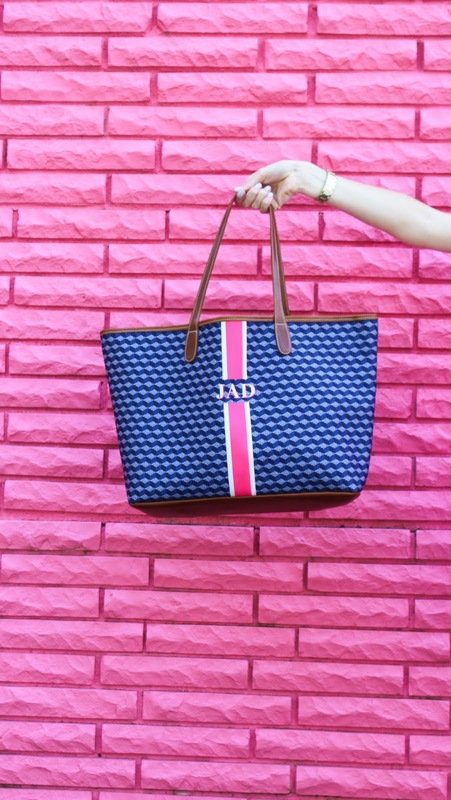 Everything from the colors of the stripe, the style of your monogram, and the trim of the leather is up to you! 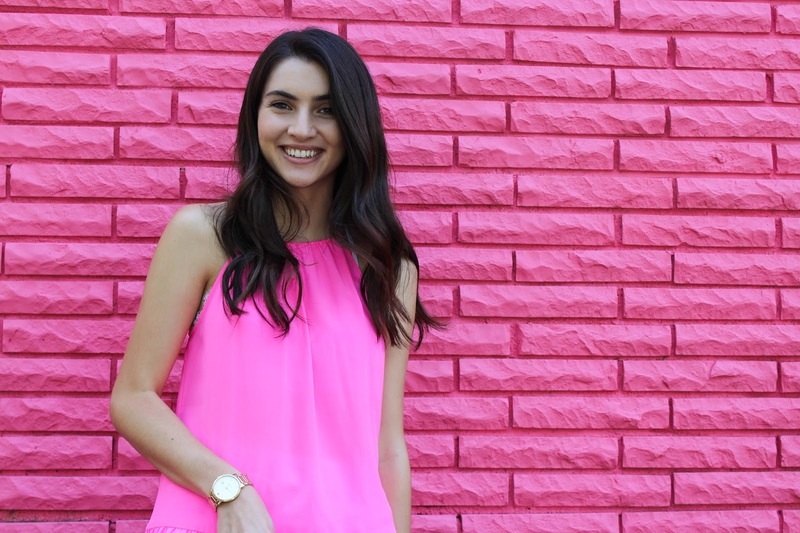 I chose to go with a pink and navy color scheme because I knew it would go with my wardrobe! 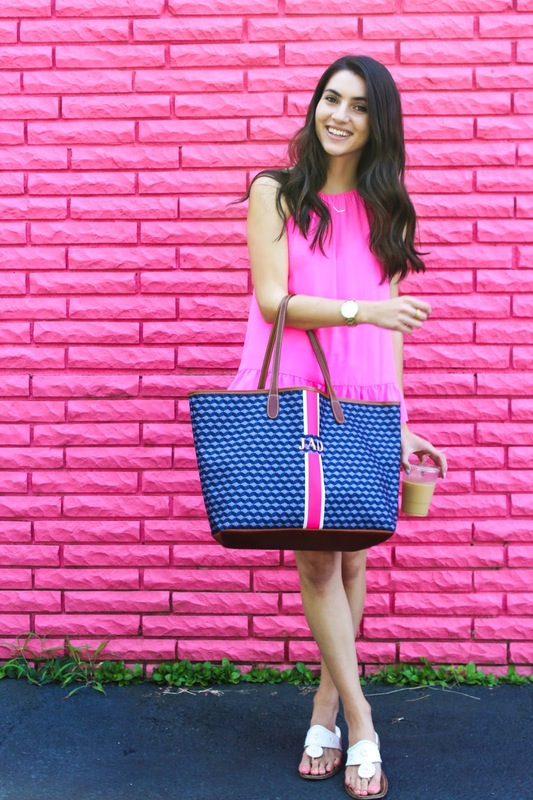 Pink walls, coffee in hand, and a cute new bag...does it get any better? I think not. For more information on my bag head over to Barrington Gift's website and Instagram! Thank you! Its mine too...if you couldn't tell! That bag is too cute! Plus that wall is seriously perfect! It's my favorite wall in Richmond:)!